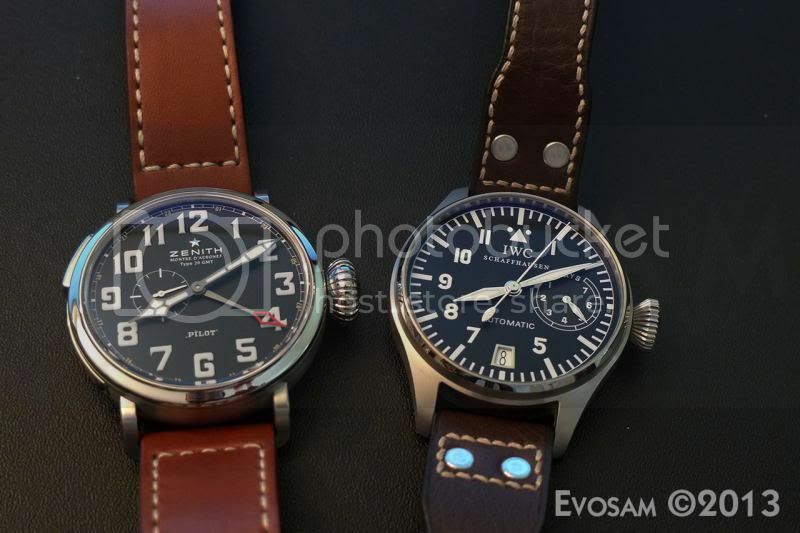 TimeZone : Zenith » The Type 20 GMT IS stunning..
...picked mine up on Wed from my local AD (a big thanks to Rob @ Toppers). I've been lusting after this piece ever since I saw the original previews that were posted online back in Jan as part of a private SIHH showing. The new Type 20 line is really well done, but the piece that really sung to me was the GMT model. I was a little concerned about the size when reading the spec sheet since it does seem like an very large case for me. I know the SE Type 20 from last yr is much much bigger, but in this new line and for my 6.5 inch wrist, 48mm seemed big. Well, after getting the call, going to the store and handling the SS version, I knew I had to have this one. The contrast of the metal, the different finishes of brushed vs polished and just the feel of the watch are just so right. It is a big watch, but because of the way Zenith designed the case with the super short and angled lugs, it's actually fits and sits on my wrist better than my IWC big Pilot. Also, the nice flat bottom ensures that the piece doesn't roll around at all. The crown is very very comfortable, it's super nicely shaped and almost organic in how smooth it is, even if it knocks against the back of my wrist at times. The dial is the sweet spot for this watch...there is so much lume on it, it glows like a searchlight. Also the contrast of the dial, the font used for the numerals and the shapes of the hands all come together in a very aesthetically harmonious package. The movement is buttery smooth, and with the torque that's created when using that massive onion crown, the watch is very very easy to wind. I believe the movement is a Zenith cal693 elite automatic movement with a 50 or so hr PR. Either way, the movement seems solid and accuracy has been good thus far. Finally, there's the strap. 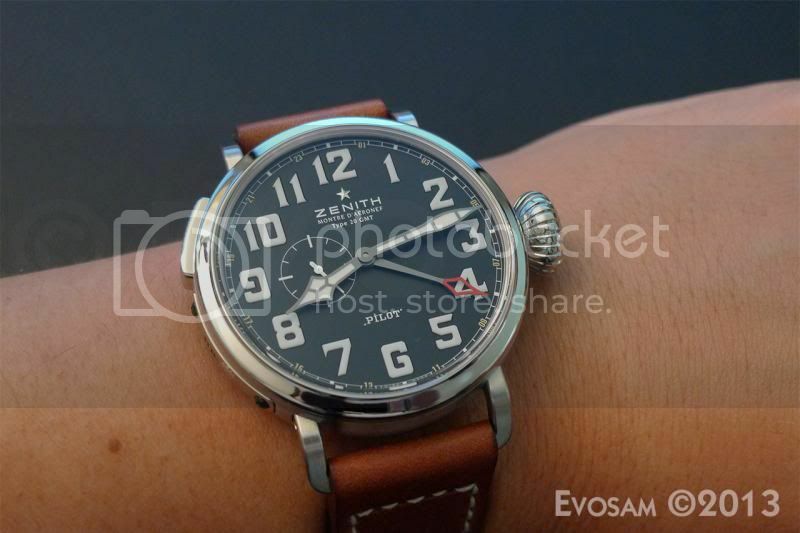 Thank you Zenith for really taking the time and sourcing a phenomenally good strap for this watch. The color of the leather is amazing, the quality and thickness of it are as good or better than any Panerai strap I've owned, and the rubber backing makes it very comfortable. 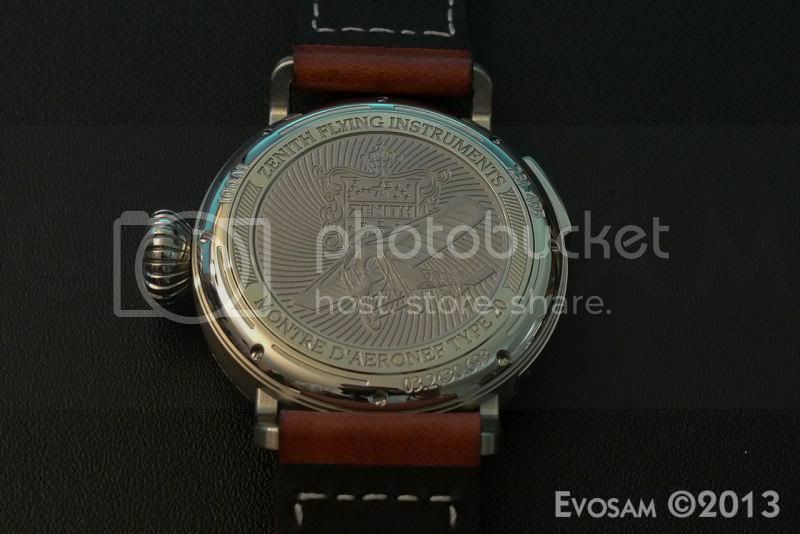 While we're talking about the backs of things, the back of the Zenith is nice as well, with a gorgeous engraving adorning the backside of the watch. I'm really happy about this watch, especially since it feels and wears just as good as the pictures have suggested. 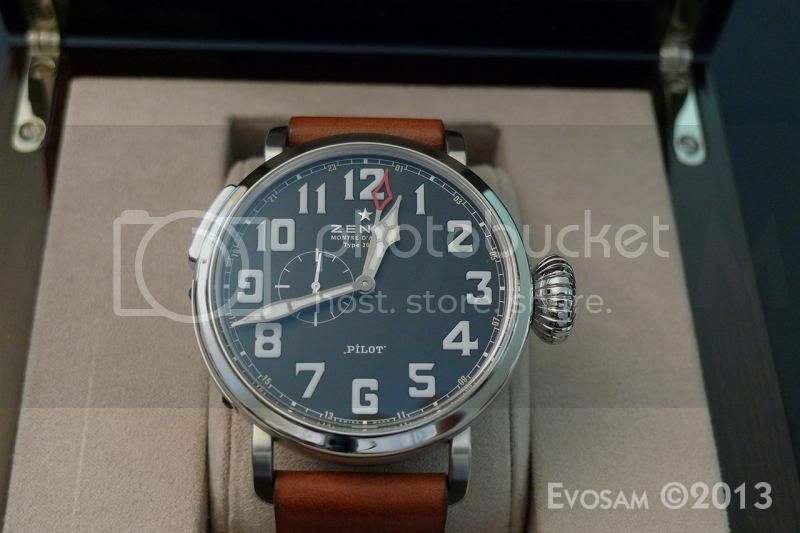 If you're on the fence about this watch, I highly recommend you go and look at one....it really is a stunning piece and for a pilot watch with an inhouse movement, a pretty fair price on what you're getting. Previous Topic: In love with this Zenith Cairelli CP2 for A.M.I.